Overview - Towards the end of the Korean War, an uneasy ceasefire is ordered, but out on the Eastern front line of the Aerok Hills, in an expanse of land called the Aero.K, fierce fighting continues. A race to capture this strategic point to determine a new border between the two Koreas is the ultimate prize. Necessary or not, war is madness. Through its tale of friendship, tragedy, and bloodshed on the precarious borders between North and South Korea, 'The Front Line' reveals just that. Heavily influenced by classic and contemporary Hollywood war epics, director Jang Hun weaves a mostly stirring anti-war narrative that is packed with visceral action and thoughtful insights. The pacing can drag a bit early on, and some of the scripting is a little too on the nose and familiar, but the film's core message remains powerful and the execution is often striking. Set near the end of the Korean War, the movie follows a South Korean Defense Security Commander, Kang Eun-pyo (Ha-kyun Shin), as he is sent to the front lines in order to investigate the suspicious death of a military captain. The top brass suspect foul play and fear that there might be a spy within "Alligator Company." When Eun-pyo arrives, the situation turns out to be much more complicated than he could have imagined. With the North Korean threat ever present, the company must band together to retake the Aerok Hills while Eun-pyo simultaneously attempts to uncover the potential conspiracy. Without giving too much away, the plot actually turns out to be much more interesting than that simple summary might imply. What at first seems like a straightforward tale about exposing a mole, proves to be a lot more original and emotionally resonant. The drama deals heavily with the devastating toll of war and probes fairly deep, revealing the contradictory effects the battlefield has on soldiers. Flashes of cruelty, kindness, insanity, and bravery litter the narrative, as the men (and women) are forced to do unspeakable things in order to survive. In a very clever twist, the line between friend and foe is eventually blurred, exposing an occasionally touching level of humanity. While I'm not sure how historically accurate it is, the film's climax is also especially infuriating to watch, and really sums up the inherent irrationality of war. The front cover of the release features a quote that draws comparisons to 'Band of Brothers,' and while I usually roll my eyes at such associations, in this case, it really is appropriate. Brotherhood becomes a central theme, and the ensemble cast does a great job creating a believable and dysfunctional family unity. Each of the characters has a distinct (albeit rather stock) personality that sets them apart, and their various relationships with one another are quite engrossing. I was especially impressed by Je-hoon Lee as acting Captain Shin Il-Young. Addicted to morphine as a means to numb the pain of his past experiences, the character still carries a certain understated dignity that commands respect. The friendship between Eun-pyo and fellow soldier, Kim Soo-hyeok (Soo Goo), is also paramount and both performers add interesting layers to their roles. While certain beats can get a little overdramatic or clichéd, the vast majority of the acting and writing is very effective, weaving a palpable bond between the characters and the audience. Director Jang Hun mostly adheres to a standard war film aesthetic, but that's far from a bad thing. The various battle scenes are visceral, gripping, and at times, truly epic. Shaky and disorienting camera movements permeate the work, thrusting audiences right into the heat of battle. An extended tracking shot that follows soldiers desperately making their way up a heavily fortified hill is especially impressive, sustaining the tension and chaos of the scene perfectly. Another memorable sequence features a single stationary shot that slowly dissolves, illuminating the changing battlefield as time passes while the camera remains still. Moody lighting design also adds another level of visual interest to the work. One combat scene lit by sporadically bursting flares is particularly striking, giving the image an almost surreal quality. Even outside of the battle scenes, the director displays a great eye, and the entire production maintains a grandiose yet still intimate feel. I must admit, this film really surprised me. The initial premise doesn't seem like much, and the opening scenes are a bit clunky and unfocused, but once the true nature of the conspiracy at "Animal Company" is exposed, the movie presents a fascinating exploration of war and brotherhood. Both epic and personal in scope, 'The Front Line' proves to be genuinely thought provoking and emotionally potent, elevating it far beyond any run-of-the-mill war flick. There are a few choppy bits here and there, and some of the drama can seem a tad over-the-top, but by and large the film remains captivating, exciting, and heartbreaking throughout. Fans of Hollywood war efforts like 'Saving Private Ryan,' and 'Band of Brothers/The Pacific' should definitely take a look. 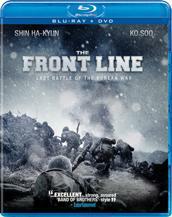 Well Go USA Entertainment presents 'The Front Line' in a Blu-ray/DVD combo pack. A BD-25 disc and a separate DVD are both included in a keepcase that comes packaged in a cardboard slipcover. After some fast-forwardable, but not skippable trailers, the disc transitions to a standard navigation menu. The packaging indicates that the release is Region A compatible. The movie is presented in a 1080p/AVC MPEG-4 transfer in the 1.85:1 aspect ratio. Despite a few minor issues, the film's stylized look comes through well with sharp detail. The digital source is mostly clean and artifact free. With that said, I did detect some marginal noise and a few instances of false contouring. Thankfully, these issues are fairly negligible. Clarity is pretty strong throughout, and the image carries a pleasing sense of fine detail, revealing all of the rough textures of the battlefield. The movie features a standard war film look with frequently blown out contrast and muted colors. The palette often veers toward fairly monochromatic yellow and blue hues. While this doesn't offer the most visual variety, the style suits the material well. Unfortunately, the overexposed whites can actually flatten the image a bit, but there are still a few scenes that exhibit a pleasing level of depth. Blacks are inconsistent, however, and often appear slightly elevated. 'The Front Line' can be a visually striking film at times, and the director presents a few truly memorable shots and sequences that really do shine on Blu-ray. Some minor artifacts are noticeable in the transfer, and the film's inherent style does lead to a few inconsistencies, but the overall video remains strong. The movie is provided with a Korean DTS-HD Master Audio 5.1 and Dolby Digital 2.0 track. With immersive and exciting battle scenes, the disc offers a mostly enveloping mix that comes up just a bit short in a few areas. Dialogue is crisp, clean and well prioritized throughout. When bullets aren't blazing, the movie can be relatively quiet with a disappointingly small soundstage. Scenes set at the soldiers' base camp feature very little ambiance and outside of speech and a few isolated effects (rustling trees, for instance), there just isn’t a lot to pull one in. Thankfully, the numerous battle sequences are a different story altogether. Whizzing bullets literally pierce through the air from all sides. Explosions disperse debris naturally around the soundstage, providing a nuanced and enveloping experience that brings the auditory chaos of war to life. As impressive as these scenes can be, bass activity feels just a bit muted, with low frequencies lacking the deep, full rumble one might expect from material like this. Balance between the various effects, dialogue, and the film's beautiful score is handled well. Despite a few quiet stretches, the film really comes to life during its frequent battle scenes, pulling viewers right into the thick of combat with strong fidelity and lively surround use. Though it still packs a punch, bass activity isn't as powerful as I would have liked, but the track's level of auditory finesse and immersion is great. Well Go USA Entertainment has provided a small and pretty useless assortment of special features. All of the extras are presented in standard definition with Korean Dolby Digital 2.0 sound and optional English subtitles unless noted otherwise. As is the case for most releases from the company, each supplement will automatically segue way into the next if one doesn't return to the main menu. Making Of (SD, 4 min) - Some cast and crew interviews are provided, along with behind-the-scenes footage. The material mostly focuses on the locations and costumes used, and details how the filmmakers' recreated the battlefield atmosphere for the shoot. Highlights (SD, 22 min) - Unless I'm somehow missing something, this appears to simply be a highlight reel of some scenes from the film. Seriously, this is just a couple of sequences taken directly from the movie presented back to back in standard definition. I'm sort of at a loss as to why this is on the disc. Original Trailer (SD, 2 min) - The film's original Korean trailer is included. U.S. Trailer (HD, 2 min) - The film's U.S. trailer is presented in 1080p with hardcoded English subtitles. 'The Front Line' is a powerful, gripping, and thought provoking examination of the madness of war and the strength of brotherhood. There are some slight pacing concerns and the movie doesn't quite reach the same level of depth as other classics in the genre, but it's a very strong effort all the same. Despite some very minor issues, both the video transfer and audio mix are good. Unfortunately, supplements are extremely lackluster. Still, the strength of the film and its technical presentation easily warrant a recommendation.